The fine peak of Stob Ban is dwarfed by it's lofty neighbours, but it is a fine prominent peak. The East facing cliffs above Coire a' Mhusgain offer some interesting looking descents, but the main draws are the deep gullies (South Gully and North Gully) either side of the main summit. The best approach is from Glen Nevis, parking in the sizeable car park on the south side of the bridge at NN145684. A good path leads up the glen to the South and into Coire a' Mhusgain. The best approach up to the foot of the cliff leaves the main path where the zig-zags begin (at NN153664), and follow a smaller path that crosses the Allt Coire a' Mhusgain above the narrow rocky gorge. From there pick your way up into the corrie. There is one relevant Scottish Avalanche Information Service forecast for Stob Ban. The fine line of South Gully is obvious from the walk in from Glen Nevis. It is a fairly wide uniform slope, with the final 15m or so a little steeper. There are a number of entrance points to choose from into the gully, but the direct line may offer the easiest angled. The gully itself is about 150m long, but the big slope below should offer a decent run down. Well worth the walk/skin up to it. Notes: Only steepens slightly at the top. 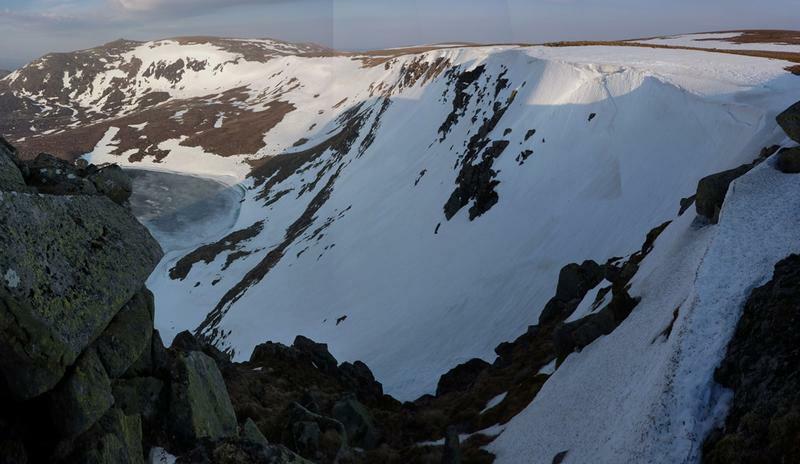 South Gully, 16th of March 2013 - Neil Fleming. Mostly hidden on the approach from Glen Nevis, North Gully is a worthwhile companion to South Gully. The top of the gully is located at a small col just to the North of the summit of Stob Ban. The cornice can be sizeable, but the best chance of an easy entrance could be at the col itself (as was found March 2013). Steeper at the top than South Gully, the wide funnel narrows in it's lower reaches, with a short narrow section before opening out onto the snow slope below. Notes: Steep at the top.